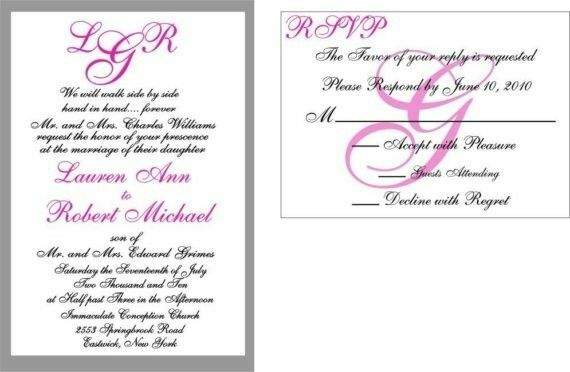 This listing is for 100 invitation suites in a beautiful modern monogram style. 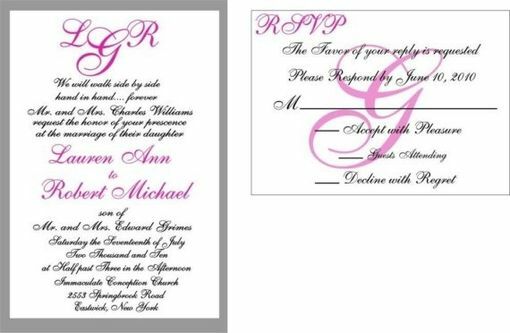 This is a flat card 5x7 invite which is printed on white or ivory cardstock and matted on a silver metallic cardstock- or any color of your choice. In the sample the monogram is a bright fuchsia pink but can be done in the color scheme of your choice. As well as the font style and monogram style, we can use just your first initials, your first names and last initial, or just your last initial, it is up to you and what fits the look and feel you would like best. Each suite includes the matted invite, coordinated rsvp, envelopes for both preprinted with your return address. This set can easily be turned into a pocketfold style invite with additional enclosure cards, please convo me to discuss details and pricing options. We can use matte finish cardstock or a linen textured your choice, as well as the matting layer can be a metallic or a standard color again your choice, whatever colors fit your color scheme.